•	Paul Johnson (drums) NZ formerly The Peddlers – U.K.
•	Ricky May, Barry Crocker, Johhny Young. •	Vennetta Fields – Blues in the Night. •	Tim Rogers (You Am I) Josh Pyke 2009 and Aug 2011. •	Principal clarinet, alto 1 Regular Army Band Full time 1988. •	Contract civilian musician with Army Band. recorded theme song for website and YouTube. 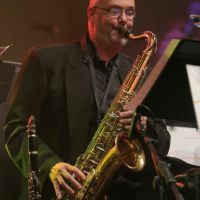 •	Former member of the WA Saxophone Quartet and the Perth Saxophone Quartet. Principal saxophonist of Premiere US Marines band. •	WAYJO Founding member on lead alto and lead tenor. was awarded a Federal Touring Grant and represented Australia. of classical and contemporary compositions. Melbourne in 1993 by Dr Peter Clinch. lead alto and saxophone section leader. •	Member of the former Will Upson Big Band. included two performances per week for 3 years. •	Telethons and Appealathons since 1984 resident band – Channel 7 and Channel 9. •	Burrows Jazz Collection on ABC TV in 1986. Dewsons, Enjo cleaning products (Clar/Fl).